To set up Tarantino to run you follow the instructions from my last couple of posts. Once you've done that, you set up a file to run the project. This is how you set up your folder structure. Under db are two folders, Create and Update. In MSBuild, all of the required files to run, plus my MSBuild file (tarantino.proj). 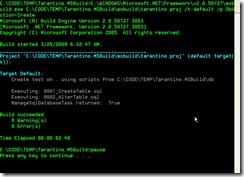 Here is how you set up a batch file to call MSBuild to run your database updates. This file is named dbdeploy.bat. I included another file called dbdeploy.Create.bat to show how I override a property. And the contents of the tarantino.targets file. Very small and to the point. It gives me the ability to make the call to ManageSqlDatabaseTask above. But what is reading versus trying? Download the code below and try this out for yourself! Update: I caught a small annoyance that occurs if you call msbuild and the path to the .proj has spaces in it (like C:\Documents and Settings\). 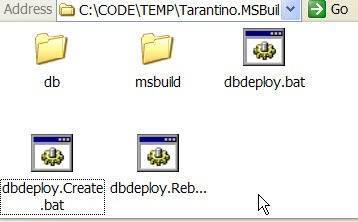 When you download, surround the path in quotes (C:\WINDOWS\Microsoft.NET\Framework\v2.0.50727\msbuild.exe "%DIR%msbuild\tarantino.proj" /t:default). Update (29 MAR 2009): I fixed the download to have that path in it.